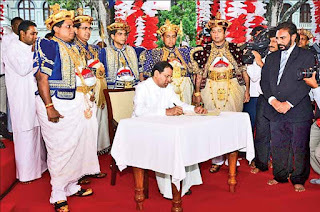 President Maithripala Sirisena yesterday signed the Gazette Notification declaring 82 victims of the Uva-Wellassa rebellion as 'heroic sons of Sri Lanka,' some of whom were killed, some sent into exile and others dispossessed after being named as traitors by imperialists simply because they provided leadership and participated in the Uva-Wellassa battle to rescue the country from the British. 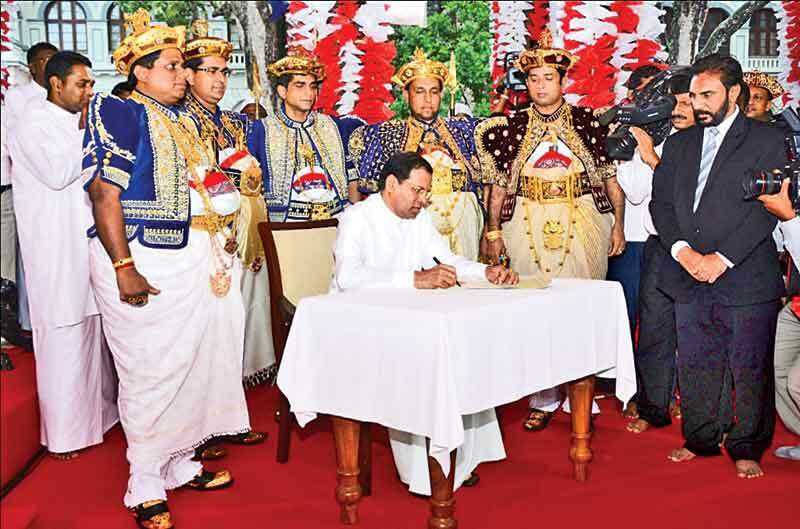 The signing of the special gazette notification took place yesterday midst religious observances at the historic Magul Maduwa near the Dalada Maligawa in Kandy. The Chief Prelates of the Malwatte and Asgiriya Chapters as well as members of the Maha Sangha, parliamentarians, Ministers and descendants of those early Sri Lankan heroes participated in this historic event. The President signed the gazette notification yesterday at the auspicious time of 04.47 p.m.